With a U.S. Presidential election rapidly approaching, political pundits and politicians are spending considerable time addressing the role of religion and religious principals in governing the nation. Yet in our increasingly pluralistic, globalized, and secular society there are many—religious and non-religious alike--who argue that theological discourse concerning the state is no longer valuable, that a post-enlightenment and post-modern society doesn’t require a close relationship between political and religious authority. In short, they argue that political theology, once dominant, is now dead. A new book from Emory University’s Center for the Study of Law and Religion (CSLR) vehemently disagrees with this diagnosis. 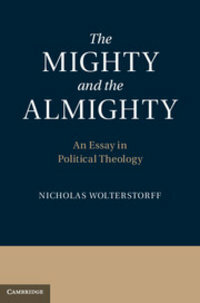 In The Mighty and the Almighty (Cambridge University Press, 2012), author Nicholas P. Wolterstorff offers readers a fresh take on the necessity of political theology. Rejecting John Calvin’s notion of “two rules,” the idea that the church and state have two separate spheres of influence, Wolterstorff offers readers a thoughtful and strong argument for a Christian political theology. He traces the historical roots of political theology, including an interpretation of the 13th chapter of St. Paul’s letter to the Romans, to provide readers with contemporary solutions. Though speaking from a distinctly Christian perspective, Wolterstorff does not intend his work to exclude non-Christians. In fact, Wolterstorff hopes that anyone interested in the health of our political system, regardless of religious affiliation, will find his research useful. Wolterstorff writes, “In a participatory democracy such as ours, it’s important that we each be open with and open to our fellow citizens concerning the deep sources of how we think about political issues.” Given the sometimes tense arguments among those holding divergent religious affiliations, Wolterstorff’s approach is much needed. Wolterstorff is Noah Porter Professor Emeritus of Philosophical Theology at Yale University and a CSLR senior fellow. The Mighty and the Almighty is a product of CSLR’sChristian Jurisprudence II Project.